Imprints of a No. 50 Paintbrush Repeated at Regular Intervals of 30 cm. Ground floor, on the wall, above the lift, and second floor in the Galerie Foy, on a tondo affixed to the wall. On the ground floor, the work has been painted on the concrete wall, above the lift door; on the second floor, the other work is a tondo affixed to the wall. This latter has been made on the lid of a wine barrel. 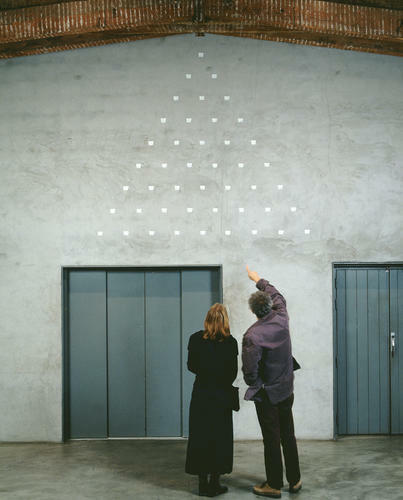 It so happens that in 1997 Niele Toroni produced an installation in the Entrepôt nave using aligned barrels covered with the famous brush mark imprints. With their rows of no. 50 brush imprints set regularly apart every 30 centimetres, these two works respond to one another and suggest something sign-like: each forms a triangle, the tip turned upwards for the one on the ground floor, and downwards for the one upstairs. Toroni lays claim to the “degree zero of painting”; he defines painting as gesture that does not cover a surface. His imprints usually have as their surface canvases on stretchers, walls of exhibition venues, and sometimes various other surfaces based on the restrictions of the premises in question. The link between work and context is accordingly quintessential. Niele Toroni was born in 1937 in Locarno-Muralto in Swiss Ticino. He lives and works in Paris. In 1966/67 he was the founder of the BMPT group made up of Daniel Buren, Olivier Mosset, Michel Parmentier and himself. This group, which was a temporary gathering of four artists whose intent it was to raise critical questions about the meaning of pictorial activity, lay at the crossroads of Conceptual Art and Minimalism.